The hit show has a new lease of life with this lengthy tour. Originally produced in-the-round, this is a chance to see the action re-directed for end-on stages and, for the most part, it’s a great fit. With a new set by Lis Evans – all suitcases, packing trunks and umbrellas – a versatile space is created, with an ancient map as a backdrop. Warwick Arts Centre’s Butterworth Hall is perhaps a bit cavernous, denying us the intimacy of the New Vic’s cosy arena – the regular theatre space is undergoing refurbishment at present – but the cast work hard to get the show across. All over again I am struck with wonder. James Atherton’s original score is the beating heart of the production, evoking sense of place and also the passage of time, as well as underscoring the action and the emotional beats of the story. Andrew Pollard’s stately but silly Phileas Fogg; a Frenchman’s satirical view of the Englishman abroad: eccentric, entitled but ultimately decent. I wonder if Jules Verne were writing today if his portrait would be less endearing, as we seem to have become a baffling, stubborn joke to the rest of the world. Kirsten Foster’s beautiful and elegant Mrs Aouda – the subtlety with which she has an effect on Fogg, awakening his emotions is a heart-warming delight. This is a Fogg to admire rather than to mock. The action sequences still astound. The long-distance fighting allows for cartoonish excesses without physical contact, and the running gag of flying banknotes and passports does not get old. Director Theresa Hawkins has created a classic piece of comic theatre, rich with physicality and also theatricality. Sound effects, especially, are brought into play to heighten the atmosphere and augment the fun. The timing is super-impeccable. It is like watching the intricate workings of an exquisite clock as the indefatigable ensemble dart around, setting and striking scenes, creating illusion and impression as well as over a hundred characters. This is a show that uses great stores of imagination to get our imaginations working. We readily buy into the swaying ship’s rails and tilting furniture and there is hilarious interplay between the world of the play and the world of the performance, with audience members enlisted to perpetuate the effects. The other players lend strong support: Pushpinder Chani’s Mr Naido, Matthew Ganley’s Colonel Proctor, Joey Parsad’s Miss Singh, all rushing about and coming and going to keep us on the move from country to country. Dennis Herdman’s nominal villain, the meddling Inspector Fix is an excellent foil for Hugo’s sweetly decent and naïve Passepartout. Herdman is also larger-than-life in his actions and reactions – we almost feel for Fix in his failures. Above all, the story retains its charm. A frivolous wager reveals the best of human qualities: selflessness and determination among them. On the road for more than 80 days, this ongoing tour is your chance to experience one of the finest productions I have ever seen. Breath-taking in both its invention and execution, uplifting and life-affirming, this is a superlative piece of theatre. Review ends. If I have repeated myself, I am not sorry. I am consulting my gazetteer to see when I can catch it again. First produced in 2013, this eye-popping show gets a well-deserved revival with the added plus that, like its protagonist, it’s going on tour. The New Vic is its in-the-round spawning ground so I’ll be interested to see how this largely visual show fares in an end-on setting – but that’s a consideration for another time. Jules Verne’s time-honoured story is, we must remember, a satire of the English by a Frenchman. 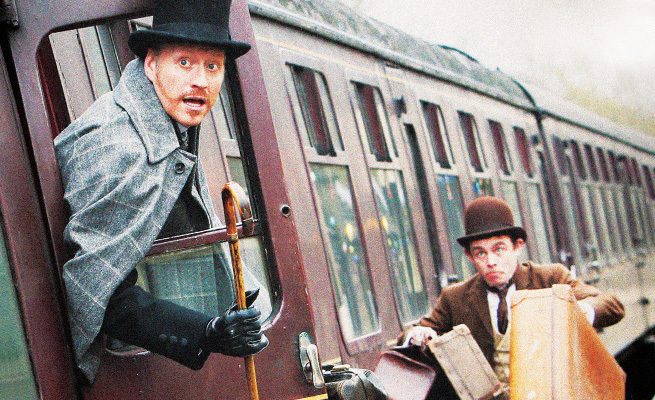 His hero, Phileas Fogg is the quintessential eccentric, a stickler and unfailingly polite. Embodied by the marvellous Andrew Pollard, he is also very funny. Pollard can express so much with stillness – it’s all in his stature; the turn of the head, the jut of the chin, can say so much. 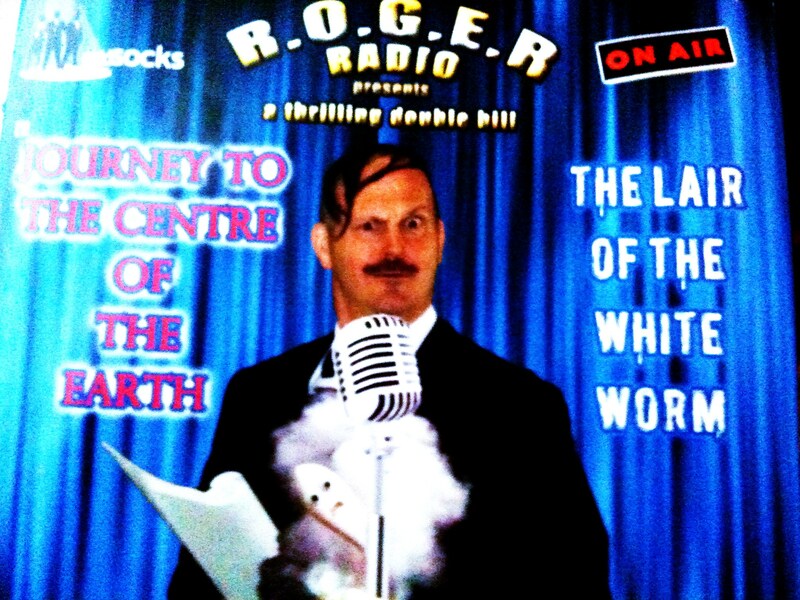 He is partnered once again by rubber man Michael Hugo, a Roger Rabbit of an actor, pulling off superhuman feats of physical comedy. Hugo’s Passepartout is an endearing fellow, with a mischievous schoolboy twinkle and a Charlie Chaplin expressiveness. You can’t help but love him. They are joined on their journey by dozens of characters, all adeptly and economically presented by a hard-working and skilful team. Pushpinder Chani charms as Mr Naidu, Simi Egbejumi-David thrills with his acrobatics, and Joey Parsad delights in a range of 21 roles! The pair are pursued by the misguided, hapless Inspector Fix whose frustration and despair are hilariously portrayed by Dennis Herdman, shouldering most of the tension of the piece as Fix fails repeatedly to get his man. Matthew Ganley is striking as the gun-toting American general. Kirsten Foster brings elegance as rescued widow Mrs Aouda – Laura Eason’s adaptation saves the emotional moments for the very end of the tale in a touching, convention-defying proposal scene. Scenes of the finest physical comedy you will ever see – a punch-up in a temple, a martial arts showdown – are underscored by James Atherton’s miraculous music: all the scenery is in his score, as drama and pacing are coloured by international sounds and rhythms. It’s as thrilling and effective as any action movie soundtrack and as important a part of the show as any of the cast. Lis Evans’s design, all maps and bulky suitcases, allows for rapid changes of costume and location, while making us feel included and along for the ride. And what a ride it is! Sleight of hand, quick changes, slow motion and a host of other theatrical tricks and conventions are brought to the mix by genius director Theresa Heskins. No detail is overlooked and it seems to me this time around, the sound effects have been punched up for added comic effect. The timing is impeccable. In fact, every aspect of the production is impeccable. It all runs with the mathematical precision Phileas Fogg espouses, yet it comes across as fresh and funny and full of heart. Seeing it in 2017 adds a piquancy no one could have foreseen. Fogg gets his way by throwing large sums of money around – all right, he doesn’t go as far as bribing the DUP but you can see where I’m going with this. At least it’s his own money, I suppose! And freedom of movement is not an issue! On the road for the next seven months, the show is visiting venues up and down the country, so you have no excuse. If it’s theatrical invention, humour and imagination you’re seeking, this signature production from the New Vic is a safe bet. Phileas Fogg cuts a dashing but aloof figure as he makes his way from bed to gentlemen’s club, in an empty routine of a life that runs like clockwork. Theresa Heskins’s marvellous production begins with an amusing sequence set to James Atherton’s evocative music, establishing a physical theatricality to the piece from the off. Fogg employs a new servant in the form of wiry and gregarious Frenchman, Jean Passepartout – this latter is seeking a quiet life but his engagement coincides with a rather silly and extravagant wager Fogg has with some of his whist-playing chums at the club. And so we see where pub talk can lead! The floor is a map of the world – a thing of beauty in itself. Around the walls behind sections of the audience hang maps of the continents through which the action travels. Actors clamber over seats and spectators to slap arrows on the maps to chart Fogg’s progress. This device, along with a couple of performance spaces among the seating, brings the audience into the action. The New Vic has never felt more intimate and yet so…global. We rattle through Europe on trains made from trunks and suitcases. The cast quickly change hats from berets to straw boaters to fezzes to provide local colour, bobbing about in their seats to convey the motion of the train. Travel by boat is similarly suggested. Actors and railings sway in unison – you almost find yourself joining in. The show is full of fun theatrical ideas. Theresa Heskins has gathered a creative and agile ensemble, wisely incorporating their ideas with her own to create a show of dazzling invention and wit. There is also another level to the silly cleverness. The show acknowledges its own artifices and celebrates them: for example in a scene on deck between Passepartout and Mr Fix, the actors sway chairs and a table to maintain the context of sea travel, but they also have a scene to play out – they negotiate their way around the furniture making sure the rhythm is never lost. But then, Fix is left alone to keep it going – we are in the scene and yet out of it. It’s “meta” (as the trendies say) but above all delightful. At the centre of it all is Andrew Pollard as cold fish Fogg, who (thanks to a running joke and sleight of hand) travels the world throwing his money around. His height marks him out as a beacon of Englishness and decency. His urgency is not motivated by financial gain but by pride; he has a point to prove and risks losing everything to make that point. Stubborn is another word for it. Keeping his nose in his book of timetables or his hand of cards, he is travelling the world but is not in the world. As Passepartout, Michael Hugo treats us to another display of his superior clowning. Every move he makes, every facial expression is spot on, calculated to maximise the humour of the situations. It’s all larger-than-life but never over-the-top. His experience in an opium den is remarkable slapstick from first puff of the pipe to passing out and then coming to and trying to drag his intoxicated body offstage. It’s a breathtaking performance and that’s before I even mention his French accent which manages to be broad and funny without exaggerating to Clouseau or Allo Allo proportions. I didn’t need the reminder but he showed me again why he is my favourite actor. Dennis Herdman’s Inspector Fix is an excellent foil for Passepartout. A fine physical comedian, he and Hugo engage in a fist-fight at long distance, a hilarious device that diffuses the violence into cartoon capers. There’s also a brawl in a temple – the funniest martial arts combat you will ever see. The supporting players work their socks off, hardly ever off-stage, and playing up to 30 parts each, in this fast-moving romp across continents. Okorie Chukwu impresses with his acrobatic skills as well as his characterisations. Suzanne Ahmet, Matt Connor and Pushpinder Chani change accents as quickly as they change their outfits; they are a metaphor for the clockwork precision with which Fogg lives his life. The action flows seamlessly from place to place; you’d think the cast was much larger than it actually is, helped along by James Atherton’s charming score, which is evocative of place and also the passage of time. Fogg looks up from his book long enough to realise a woman needs rescuing and so, courtesy of an astounding but simple appearance of an elephant, the beautiful and elegant Mrs Aouda (Kirsten Foster) is saved and becomes his travelling companion for the rest of the journey. From this point, Fogg is more in-the-moment, problem-solving and using up his resources to achieve his ends. It’s not saying if you’re rich you can do anything you want. When Fogg is on the brink of ruin, Mrs Aouda proposes marriage. She wants the man not the money. Fogg learns that life is to be experienced and not read about and is rewarded with someone with whom to live it. This is a message to all those of us who keep our eyes on our phones, viewing experiences through camera apps rather than experiencing them first hand. You haven’t got 80 days to see this exhilarating production. I suggest you make Fogg-like exertions to get there. Already I’m thinking this is the best show of the year. Oddsocks Productions, renowned for their adaptations of Shakespeare and other classic works, have other strings to their bow. One of those strings is the R.O.G.E.R. Radio format. This is the second of their shows in this format. The premise is simple but rich. The plots are framed as live recordings of radio drama at which we are privileged to attend and in which we are invited to participate. The cast of three, in evening wear, create all the characters through vocal work, and provide sound effects in the time-honoured way (shoes on a tray of gravel) and also in some inventive ways, often exaggerated to cartoonish extent. But there is more to it, another level. There is a tension between the performers outside the story they are performing. We are constantly pulled out of the fictional world they create and into another one. Added to that are the visual gags, unsuitable for a radio play, that give us the theatre audience plenty to look at. Perhaps I’m making it sound more complicated than it is. Perhaps it’s like trying to explain a joke; a joke dismantled is robbed of what makes it funny. And this show is relentlessly funny. We are treated to a double bill of classic stories. First up is Jules Verne’s Journey To The Centre of the Earth – a Boy’s Own adventure of exploration and discovery. Played straight, the radio drama would paint pictures in our minds. We would imagine all the special effects better than any Hollywood adaptation. Here, there is an element of that but we are constantly drawn back to the radio studio and the creation of the piece before our very eyes. The story falls secondary to this organised chaos. The story is a coat-stand on which to hang all the silliness of the format. Being an Oddsocks show, there are wild wigs and silly voices and even puppets. The script by director Andy Barrow and Elli Mackenzie is riddled with double entendres, double talk, word play and silliness. There is a running gag with an echo in a bucket that, just as you think it’s wearing thin, reaches its hilarious pay-off. Barrow knows what he’s doing – the pacing is spot on. There is, inevitably, audience participation; my contribution to a flock of doves sounded more like a Trimphone but there is something marvellous watching hundreds of people shouting lines from cue cards in funny accents. We are a nation brought up on pantomime after all. The second story The Lair of the White Worm is the more coherent narrative of the two. It’s as though the first one is the set up for the second, familiarising us with the conventions of the piece. Bram Stoker’s gothic melodrama has a range of weird characters that lend themselves more readily to an Oddsocks parody. It is also rich with Freudian symbolism which means, in this case, an unending supply of knob and hole jokes. It’s cheeky schoolboy stuff but never grubby or puerile. There are mongooses (Mongeese? Mengeese?) who meet sticky ends; animal cruelty has never been this funny. Andy Barrow himself leads his company of three. As resident genius of the company, he is a theatrical force to be reckoned with. Joseph Maudsley has a suave, self-satisfied air as he pulls off some of the trickier sound effects, in role as a smug actor playing these characters. And it’s a pleasure to see Susie Riddell back with the company. All three are vocally versatile, energetic and disciplined. That said, there is room for manoeuvre and improvisation when things don’t go exactly to plan. A cleaver fails to hack through a cabbage. An attack with a water-sprayer becomes too enthusiastic… You have to see these things to appreciate them in context. The accidents keep the show fresh for the actors. Clearly they are enjoying themselves immensely. That enjoyment transmits to the audience. It’s a winning formula and I look forward to further stories receiving the R.O.G.E.R. Radio treatment. This production deserves to be seen by a wider audience in a range of venues across the country. It’s Round the Horne on Red Bull, The Goon Show on a sugar overdose. You’d be hard pressed to find a funnier and more gloriously silly night out.